Spanning 71 or 74 inches over its optimized 3D airfoil shape, the APR Performance GTC-500 Adjustable Wing supplies maximum downforce in widebody sports and touring car applications. The Downforce Balance graph (shown at the left) illustrates which areas of the vehicle this product affects. There are three (3) areas: Front, Center, and Rear. The size of the red bar represents how much this product affects each particular area. 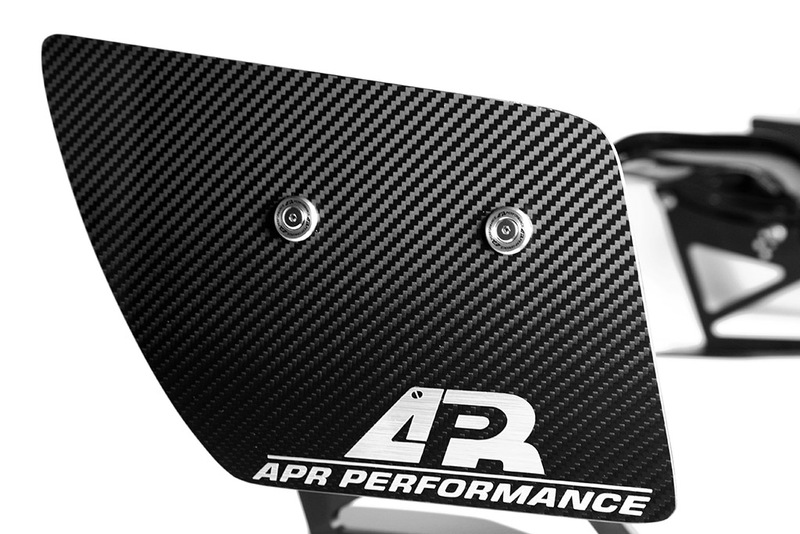 The APR Performance GTC-500 Adjustable Wing features a 3D airfoil shape that is designed to produce balanced downforce across its span on widebody sports and touring car applications. 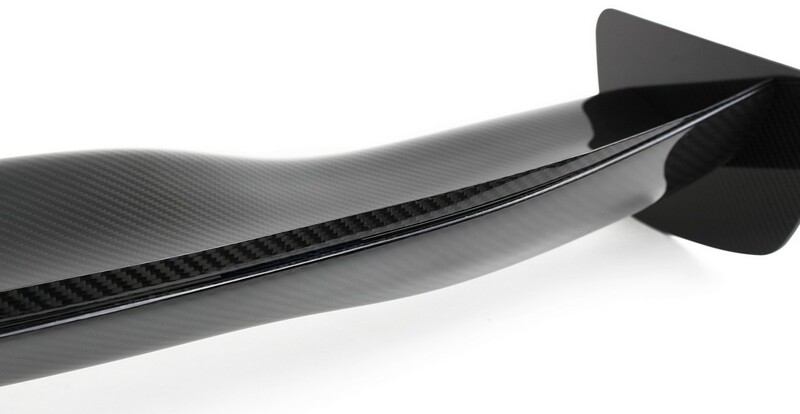 Each GTC Series airfoil is composed of lightweight and durable pre-preg carbon fiber composite materials for superior strength and low weight. 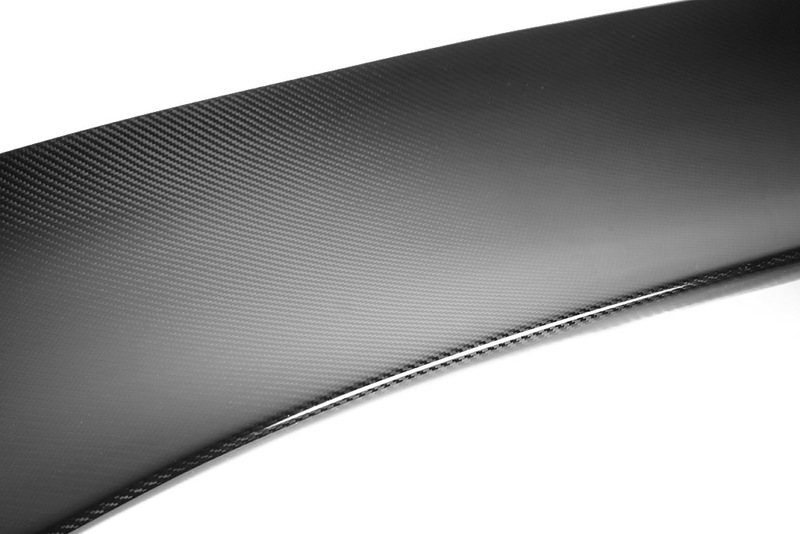 Aerodynamically-tuned side plates (aka end plates), included with every GTC Series Adjustable Wing, are critical components that help to ensure consistent airflow across the full span of the airfoil. 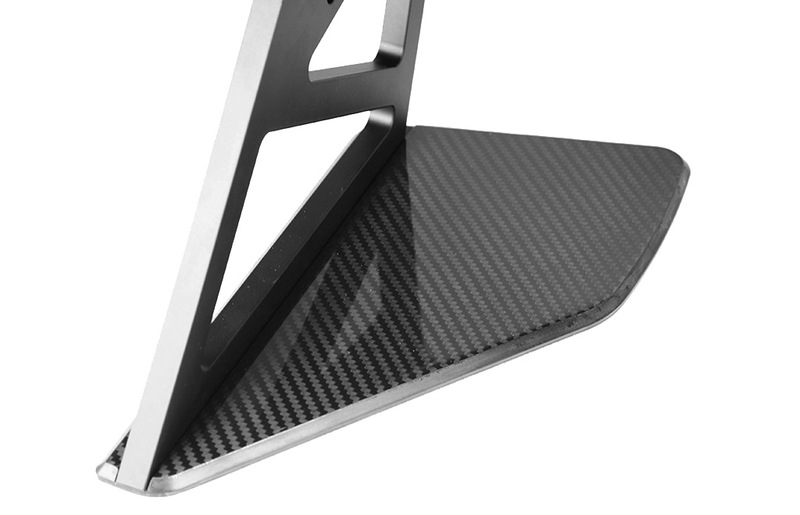 Supporting the airfoils are 10mm "aircraft grade" 6061 billet aluminum pedestals that come in a flat black powder coat finish. Modeled in 3D and validated using Computational Fluid Dynamics (CFD), the APR Performance GTC-500 Adjustable Wing is designed to adapt to a variety of widebody sports and touring car applications. 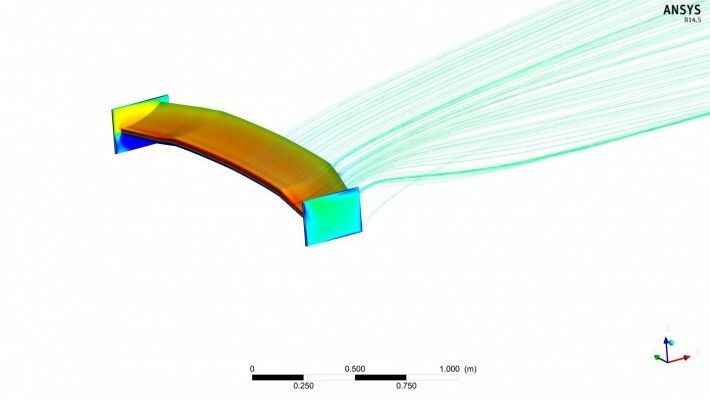 Contained herein are the data and results of the Computational Fluid Dynamics (CFD) analysis that was conducted on the GTC-500 airfoil. This data illustrates how the airfoil performs in different conditions by comparing Downforce vs. Angle-of-Attack (AOA) vs. Speed, and Drag vs. AOA vs. Speed. This data will provide insight with regards to how and how much the airfoil performs with respect to these conditions. To learn how to interpret and apply this type of CFD data, see sample analysis on the GTC-300 page. The following table shows the actual data that were collected from the CFD analysis. The numbers in the table are represented in Pounds. The following image illustrates where and how the AOA is referenced. At 0 degrees AOA, the reference plane is parallel to the direction of the free air stream (the stream would travel from right-to-left in this image). This reference plane can be simulated by placing a ruler across the top of the center section of an actual airfoil. The following graph illustrates the effects that air speed and AOA have on downforce only. The higher the air speed and AOA are, the higher the resultant downforce is. The following graph illustrates the effects that air speed and AOA have on drag only. The higher the air speed and AOA are, the higher the resultant drag is. The following graph illustrates the lift and Drag Coefficient Ratio. The following image illustrates the pressure distributions across the surfaces of the airfoil. The following image illustrates both the pressure distribution and streamlines associated with the airfoil. The information contained herein is property of APR Performance, and may not be reproduced in whole or in part without prior written consent from APR Performance. 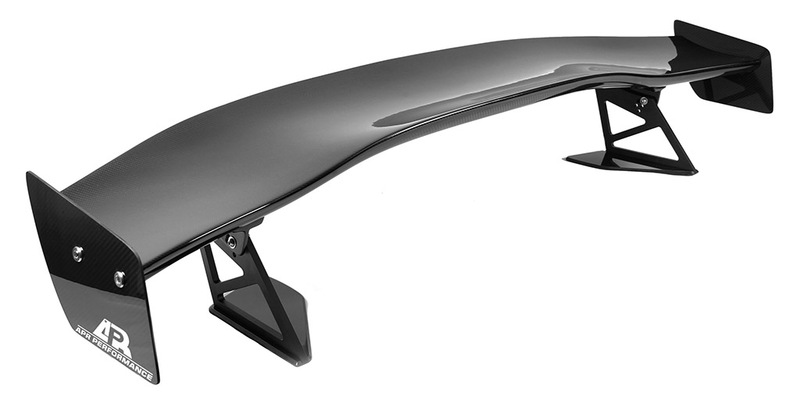 Gurney flaps are available for all APR Performance GTC Series (200/300/500) wings. These are super lightweight, made using pre-preg carbon fiber processes, and conform perfectly to the contours of the GTC series 3D airfoils. They are easily attached using the included double-sided tape. 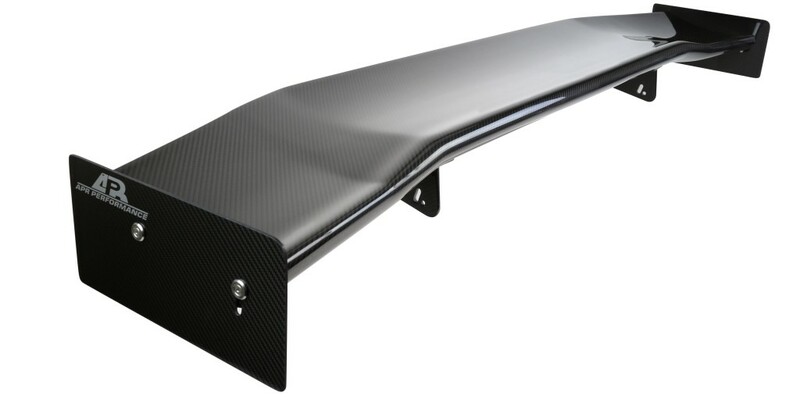 The Gurney flap (a.k.a. wickerbill) is an aerodynamic device that was originally pioneered and developed in the 1970s by a racing driver named Dan Gurney. Unbeknownst to his competition, this device was used to increase downforce while minimizing increase in drag. He found that not only did this device increase the lift/drag (L/D) ratios, it also increased the stalling angles (so he could operate the airfoils at greater pitch angles). It took a few years for everyone else to catch on to its purpose, and now, the Gurney flap (or similar device) can be seen in race cars and even airplanes all over the world. Measurements for the GTC-500 Adjustable Wing are shown in the table below. Pedestal-to-pedestal distances are indicated for standard applications. Custom pedestal-to-pedestal distances can be accommodated for custom applications. GTC-500 Universal 71" # 13.5" 47" 7.25" 12" 5"
Acura NSX 1990-2005 71" # 10.5" OEM 13.0" 12" 5"
Audi R8 2006-Up 71" # 10.5" 43.75" 7" 12" 5"
Cadillac CTS-V Coupe 2009-Up 71" # 10.5" 44.5" 7" 12" 5"
Cadillac CTS-V Sedan 2009-Up 71" # 10.5" 34" 9" 12" 5"
Chevrolet Corvette C6 2005-Up 71" # 10.5" 56" 9.0" 12" 5"
Dodge Viper Convertible 2003-Up 71" # 10.5" 26.5" 9.0" 12" 5"
Dodge Viper Coupe 2006-Up 71" # 10.5" 30.5" 9.0" 12" 5"
Ford Mustang S197 2005-Up 71" # 10.5" 49" 9.0" 12" 5"
Mazda RX-7 1993-1997 71" # 13.5" 47" 7.25" 12" 5"
Mitsubishi Evolution 8 / 9 2003-2007 71" # 13.5" OEM 9.0" 12" 5"
Nissan GT-R R35 2009-Up 71" # 10.5" 42" 9.0" 12" 5"
Subaru Impreza WRX/STI 2002-2007 71" # 13.5" 48" 7.25" 12" 5"
Toyota Supra 1994-1997 71" # 15" OEM ** 12" 5"
#Variable cord length (12.75" Inner/9" Outer). **Fiberglass Mounting Base Included. Vehicle-specific and custom applications are listed below. Custom pedestal-to-pedestal distance, built-to-order. Standard-height pedestals are used. User assumes full responsibility for ensuring proper installation as intended. Professional installation by well-qualified personnel is highly recommended. The vehicle applications shown above are intended to work as a complete system when installed onto original vehicle body parts (i.e. trunk lids, hatches, etc.). To insure proper function and reliability, APR advises against modification or substitution of any component of the intended installation. Any modification or substitution of the airfoil, side plates, pedestals, mounting bases, mounting brackets, or hardware included with the wing kit may create unsafe operating conditions and ultimately cause this system to fail. Substitution of original vehicle manufacturer parts needed for the intended installation (i.e. rear trunk lid or rear hatch) with non-original parts may also create unsafe operating conditions and ultimately cause this system to fail.